Looking at the real hoof, this effect is easily seen. 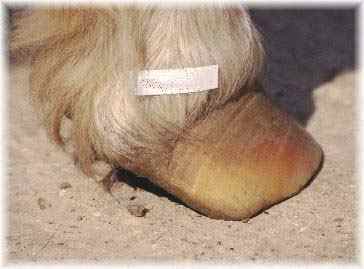 While the hoof grows at the same rate at the toe and heel, the foot grows without distortion, but when the heels grow faster the hoof capsule becomes distorted. (Fig. 5). 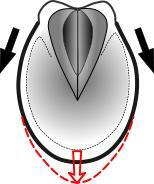 In the early stages of the acute phase, distortion will be concentrated at the distal border of the dorsal hoof wall. As the heels continue to grow the dorsal wall will be elevated away from the distal phalanx in a peeling motion as the distortion migrates up the dorsal wall (Fig.10 - Arrow B). Peeling provides a better explanation for the separation observed between the distal phalanx (pedal bone) and the dorsal hoof wall, it is the most efficient method of mechanically separating two strongly bonded surfaces and requires less force, peeling would also be very painful. 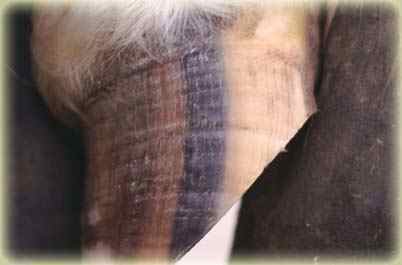 When the peeling process has separated enough laminar attachment, the distal phalanx will be detached from the dorsal hoof wall. As the distal dorsal wall is lifted, the solar horny plate will be pulled upward towards the distal border of the distal phalanx. This upward movement of the horny sole will compress the solar corium, causing pain within the solar corium and compromise blood flow by entrapment (Fig. 10 - Arrow C). Bruising is often subsequently seen in this area of the sole after laminitis and is evidence of this trauma to the solar corium. As the distal dorsal wall is lifted, the proximal border of the dorsal hoof wall will be pressing inward, again causing pain and compromising blood flow (Fig. 10 - Arrow A). 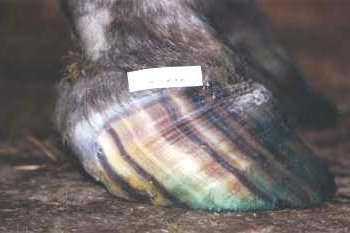 Horn growth at the proximal border of the dorsal hoof wall is often restricted in severest forms of acute laminitis. By including the hoof capsule in a causal role in laminitis, the qualities of the hoof can be seen as influencing the intensity of pain felt by the laminitic animal. The level of pain experienced during the initial phases of acute laminitis can be correlated to the shape and strength of the hoof capsule. 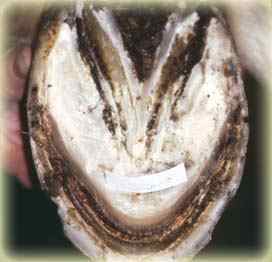 In round feet, hoof distortion will spread from the toe medially and laterally towards each heel, causing the whole hoof to expand open, this will predispose the distal phalanx to sinking as a greater area of laminar attachment is lost (Fig. 11). 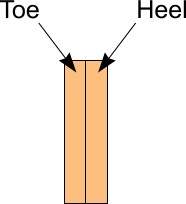 Long narrow hoof capsule shapes will tend to predispose the foot to rotation as most of the distortion will be concentrated at the toe of the hoof (Fig. 12). Flat-footed equines with weak hoof capsules will often present with a vague bilateral lameness that is difficult to initially define as laminitis. The rapid heel growth will be 'dissipated' in an abaxial (splaying heels) direction and subsequent distortion of the dorsal wall will be minimal (Fig.13). The concept of both 'lifting' and 'dissipating' hoof shapes can be observed in asymmetric hoof shapes, where the medial and lateral heels will be at different angles and have different shapes. The upright side can be considered as having a lifting shape while the sloping side a dissipating shape. In this type of laminitic foot, the laminar wedge could be predicted to occur in a non-central toe position. 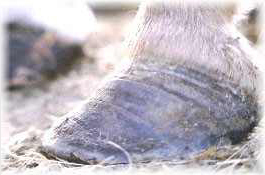 Observation of asymmetric laminitic feet confirms this, with the laminar wedge biased towards the more sloping or dissipating side of the hoof (Fig. 14). 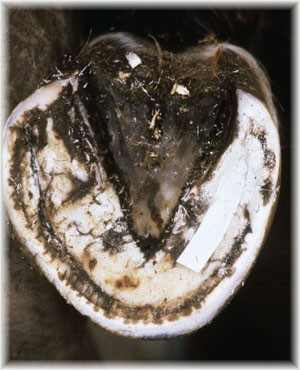 The orientation of the laminae will highlight the direction in which the hoof distorted. 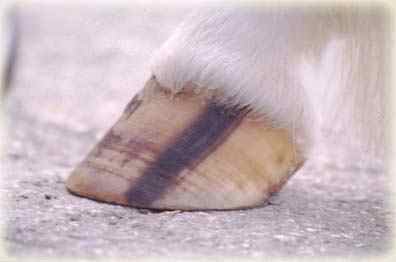 The laminae and the underlying laminar corium can be considered as victims of hoof distortion rather than having a causal role in laminitis. 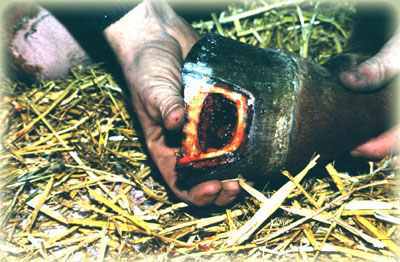 As the hoof capsule distorts the laminae become visibly elongated, this 'laminar wedge' (Fig 15), its qualities will be an important factor in the outcome of the laminitic event. 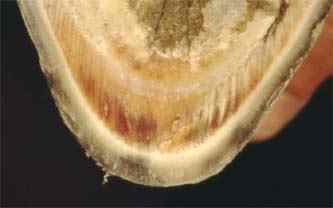 A weak or non-existent laminar wedge will leave the distal phalanx vulnerable to rotation or sinking and all its associated complications, while an intact laminar wedge will provide attachment between the elevated dorsal hoof wall and distal phalanx, reducing the risks of rotation or sinking. 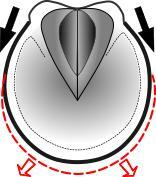 The orientation of the distended laminae indicate the direction the hoof capsule has distorted. 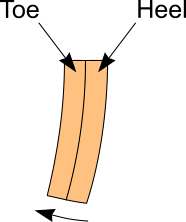 In cases of very rapid hoof capsule distortion there will be insufficient time for the cells in the laminar corium to divide quickly enough to form a laminar wedge. The laminal bond is overwhelmed and fails catastrophically leaving the hoof and distal phalanx separated by a void with no distended laminae (Fig 16), causing rotation or sinking to take place very quickly after the acute phase commences. When resecting severe early post-acute cases a void with no evidence of distended laminae can sometimes be found. The void can contain blood, these cases are sometimes referred to as cases of laminar liquefaction, because of the absence of distended laminae and the presence of blood. This term is misleading and inaccurate, the laminal bond has failed catastrophically in a short period of time and the void has filled with blood, forming a haematoma (Fig.17). A disruption ridge will eventually become visible a month or so after the acute phase having been concealed by the perioplic horn that covers the coronary band. The ridge will be further down from the coronary band at the heels than at the toe and is confirmation of rapid heel growth (Fig. 18). The delay in the emergence of this disruption ridge probably accounts for why differential hoof growth has always been considered as a consequence of laminitis rather than contributing to the cause. The dorsal hoof surface will have two angles, with the hoof wall below the disruption ridge being at a lower angle then the one above. 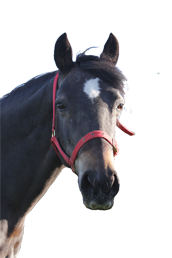 Many of the normal methods of treating laminitis can be justified within the context of the dorsal wall lifting theory. Dorsal wall resections will remove a section of hoof wall that is exerting a lifting force onto the underlying dorsal laminae. Undermining the coronary band with a groove (Coronary grooving) can also be justified as it removes the effects of dorsal wall lifting on the coronary corium, enabling the dorsal hoof wall to re-grow more normally. The proposal of a dorsal wall lifting theory is not a rejection of scientific research or literature previously published on laminitis, which in general has struggled to confirm why the laminae fail. When reviewing the scientific literature in the context of dorsal wall lifting, it is difficult to find evidence that discredits the dorsal wall lifting theory, many of the observations at all pathological levels are consistent with this model. When the syndrome of laminitis is considered from the viewpoint of a distorting hoof capsule affecting the sensitive structures of the horses' foot, many of the inconsistencies of the traditional model are resolved. We know that laminitic hooves do distort and the hoof growth survey confirmed that the heels are growing at an accelerated rate, but what changes take place within the foot that induces the heels to grow faster or when this starts to takes place is unknown at the present time. As the concept of early and rapid heel growth is at the core of the dorsal wall lifting theory, this would be an obvious starting point for a future research project. The hoof capsule has in the past been considered as an obstacle to our understanding of laminitis, we have been trying to see through the hoof, in an effort to find out what is happening to the internal laminitic foot, almost ignoring the hoof altogether. 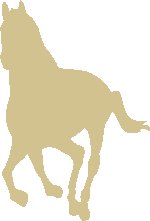 This new interpretation of laminitis is still in it's formative stages, it is hoped that further research will be directed toward confirming that this model is a more accurate account of the changes seen in the feet of equines suffering with laminitis. Time will show how accurate this proposed model is. Whatever the outcome of this research, we must continue to look for ways to help the laminitic equine.